Samsung Electronics video and display chief, Han Jong-hee, says that Samsung aims to release a Micro-LED consumer TV next year. The TV will be a high-end premium set that will be called the Wall Luxury - and will not be priced as high as people think. It's not clear whether this consumer version of The Wall professional will be modular. Han did say that it will be thinner than the current version at only 30 mm thick (the Wall Professional is 80 mm thick). This is still quite thick compared to current OLED TVs. 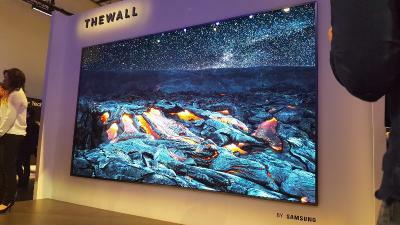 Samsung officially launched "The Wall Professional" in the US last month and started to accept pre-orders - although it did not reveal the price yet. It is expected to cost at least $100,000 for the 146" model. Samsung hopes to find customers in lobbies, museums, galleries, and retail spaces. The Wall Professional features HDR 10+ and its brightness is up to 1,600 nits.